The dry river bed in Andrea La Nauze’s backyard inspired her to study economics. Fellow Australian Marcus Cox just wanted to quench thirsts with his self-crafted brews. Together, the two make the perfect duo. La Nauze, now a Pitt economics professor, and Cox moved from their native continent to the United States last year in pursuit of their respective professions. La Nauze, 34 and freshly armed with her Ph.D., came to teach and research, and Cox, 43, to become a top brewer in America. But she also recalls growing up in a time of drought. As farms cut back on water and families added water tanks, La Nauze found all the choices water’s scarcity forced fascinating. That curiosity directed her to economics, which centers on similar decision-making process. “I loved that it could provide you with a framework for thinking about tough problems, not just ‘we should, we should, we should’ — [economics is] thinking about tradeoffs,” La Nauze said. It was while learning about supply and demand at the University of Melbourne that La Nauze met Cox. He was working at the Belgian Beer Cafe with her roommate. Cox had been interested in beer ever since he was a teenager because of “the other Michael Jackson” — a British television personality with the same name as the pop star, who toured the world to find rare beers and is credited with helping spark the craft beer movement. Jackson’s thick beard and beer pairings entranced Cox, so he started take an interest in foreign, especially Belgian, beers as a teenager. La Nauze and Cox met at the Cafe one night 15 years ago, where Cox worked behind the counter. La Nauze claims Cox tried to speak Italian to woo her. Unbeknownst to him, she was studying the language. “I asked him a few questions in Italian, and he wasn’t able to answer them,” La Nauze said with a laugh. 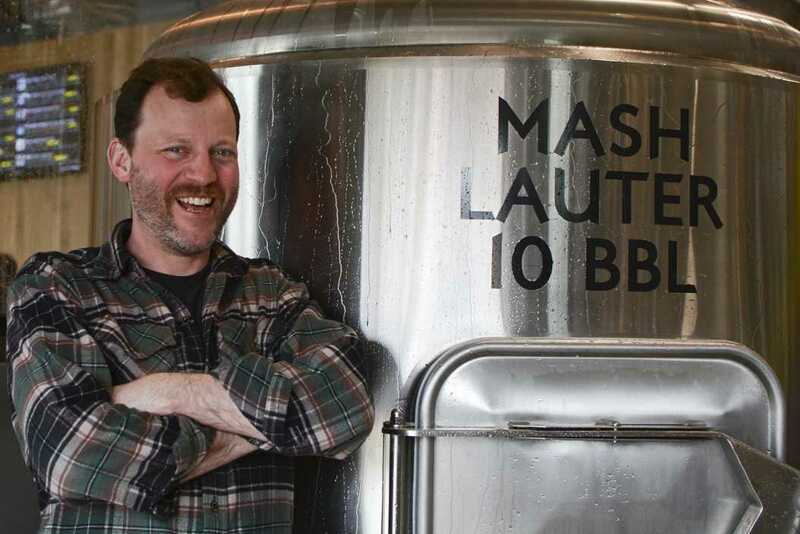 At roughly the same time that Cox and La Nauze began dating, Cox found his entrance to brewing. Some engineers had a brewery in northern Australia, named Three Ravens, and had outfitted it with fancy new equipment — but they didn’t have a brewer to run it. Three Ravens hired Cox, and he learned to create beer on the fly. By the time La Nauze was finishing up her doctoral degree in early 2016, Cox was running Thunder Road Brewery — named after an Australian movie, not the Bruce Springsteen song — in Melbourne. La Nauze knew she wanted to go into teaching and research as a way to spend more time on the issues that intrigued her — such as water use and renewable energy. She applied to more than 100 positions, heard back from about 20 and scheduled all the interviews during a three-day span in San Francisco. La Nauze wanted a job in the States because of the “cutting edge” work done in economics — according to US News and World Report rankings, nine of the top 10 economics schools in the world are in the U.S. Meanwhile, Cox needed a new challenge after turning Thunder Road in Melbourne from “an empty building” to an award-winning brewery. But according to Allison Shertzer, a 33-year old professor of economics at Pitt who specializes in immigration — and a friend of La Nauze — there would be one caveat. “There’s always this problem, because the H-1 visas do not grant the spouse the privilege to work in the United States,” Shertzer said. Both La Nauze and Cox said they agreed to relocate together regardless of the outcome, but La Nauze would have hated to make her husband give up his career. Luckily for the two, since 2005, there is a special visa for Australian citizens — the E-3 — which lets spouses work in the US. It’s the “one modern visa program” that works with 21st century couples, according to Shertzer. After a cousin told her about the visa, La Nauze flew to Pitt — ranked 39th in economics by US News and World — to tour campus and make her final pitch for employment, knowing her husband could work as well. She arrived on campus in the midst of a snowstorm and was immediately swept into a faculty meeting, or “bagel hour.” Despite the blizzard, she was enraptured by the faculty around her — as well as the breakfast. “Australia doesn’t have amazing bagels,” she said. As if the delicious breakfast wasn’t enough, Pitt also offered La Nauze a job — her first offer. She didn’t wait for any others. La Nauze started at Pitt in fall 2016 while Cox started working at a new brewery, Mindful Brewing Company, in Castle Shannon in January. Cox found his job through an online brewer’s forum and runs the beer-making operation with fellow brewer Nick Jones. It serves as a welcome restart for him, working with mainly American ingredients for the first time in his career. When it comes to choosing, even though Cox sees himself as a “conservative” brewer in terms of beer diversity, there are many styles on tap at Mindful, from IPAs and an Australian ale to an Irish stout and a “wacky” seasonal beet beer. Made with special German yeast and colored a rich red, the seasonal beer was inspired by Cox’s hope to make a beer with fresh, local Pittsburgh ingredients. But “the only thing fresh was potatoes, onions and beets” in winter, he joked. Meanwhile, 20 minutes away in Oakland, La Nauze has been teaching and working on research on renewable energy prices. She’s also trying to accustom herself to the banal features of her new home, but there is one thing she misses — Vegemite. It’s an Australian staple, a salty spread made up of old brewer’s yeast and vegetables. After grumbling to her husband, however, La Nauze found a surprise in the mail. “I was complaining so much that Marcus got on Amazon and had some shipped,” she said with a chuckle. They could afford shipping the package nearly 10,000 miles because business had been good. Cox knew of Pittsburgh’s reputation as “a shot and beer” town but didn’t think it would mean selling beer at midday. No matter the time, Cox has noticed Pittsburghers seem ready to drink. “It’s not a question of if I’ll have a beer — it’s a question of what beer I’m going to have,” Cox said.